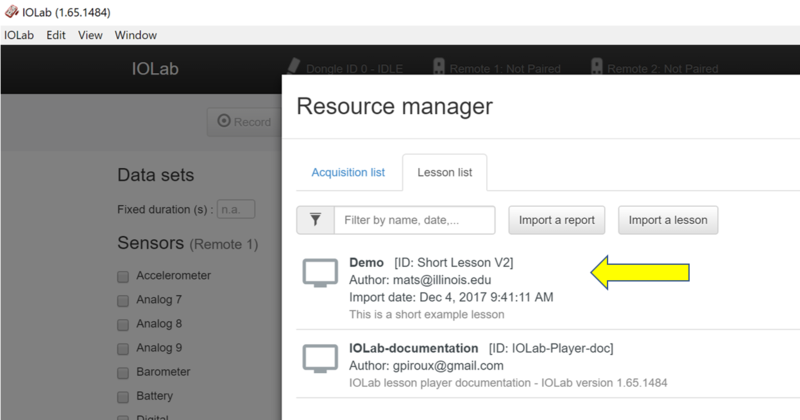 The iOLab lesson player provides a mechanism for delivering step-by-step hands-on lessons to students online, saving their data and their responses to questions as an online lab report that can be graded by their instructor. As of iOLab software version 1.64.1457, the lesson player has the ability to create a printable PDF version of a student's lab report, and as of version 1.65.1484 we added a lesson import button. 1) Download and extract the latest iOLab application from the Application page . 2) Download the file Demo_Lesson.zip and put it someplace handy, like your desktop. You can delete this file after you import the lesson. 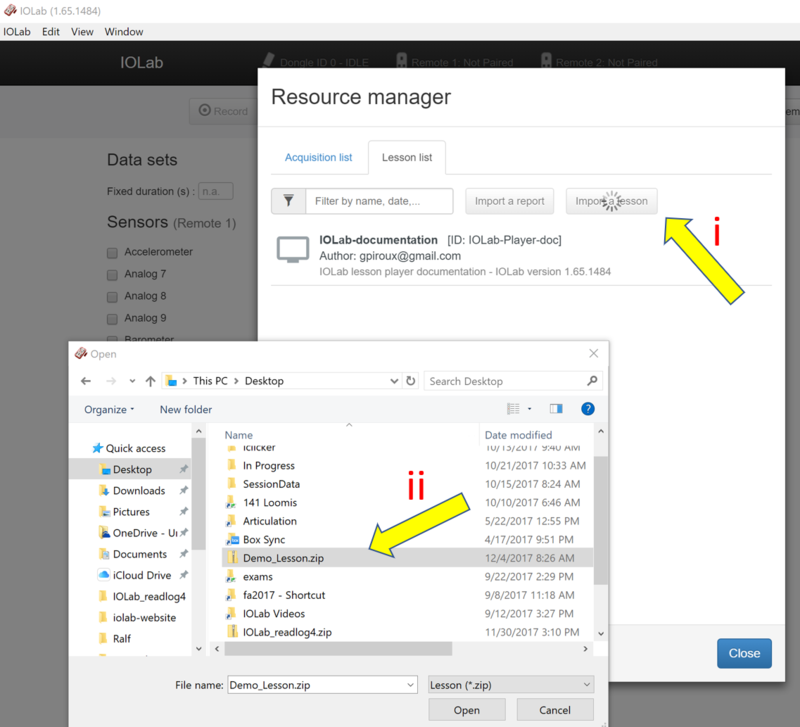 3) Run the iOLab application, open the resource manager (folder icon) and select the Lesson list tab, click on the Import a lesson button, and navigate to the Demo_Lesson.zip file you just downloaded, and click the Open button to import the demo lesson. 4) The demo lesson will now appear in your Lesson list tab, as shown below. Notice that there is another lesson file there as well, called iOLab-documentation. This file came as part of the application (i.e. you didn't need to install it) and contains detailed documentation on the commands recognized by the Lesson pLayer. 5) You can explore the elements of the actual lesson of you go to the Documents/iOLab-Workfiles/activities folder on your Mac or PC. The Import_yyyy-mm-dd... folder contains the lesson material you just imported, and you can explore this to find the Demo.html file which defines the lesson, and the images folder that contains images used in the lesson. The Demo.html file can be viewed in any text editor. Creating a printable PDF Lab Report. Students can run the iOLab application without installing PDFtk; they just wont see the document icon. In this mode of operation the instructor can still create the merged PDF file from a students .lab file as long as students are using application version 1.64.1457 or later.